You're probably not missing much with the Shannara books. The three originals were great when I was 13. Now as a mature reader, the writing itself is actually pretty bad to the point of distracting. His writing was much better in his later books, but then they eventually became predictable formulaic writing, giving the impression he's just churning out paychecks with those. The four-part heritage of Shannara Series is probably the only set wort reading, maybe the standalone Druid of Shannara too, though it's been years since I read them. On the other hand, his other series (Running with the Demon, Knight of the Word and Angelfire East) was great. I can't remember what the series is called though. They are unrelated to the Shannara storyline and you could probably burn through them pretty quickly. H.P. Lovecraft. I portend to run a weird media blog, without ever having read the originator of the weird! I do have the Necronomicon on its way, and that will jump to the head of my list as soon as it gets here. Robert Heinlein. I read and loved Variable Star, but I don't think that counts. I've tried reading Stranger in a Strange Land a half dozen times with little success. It was just boring to me. Also read but bounced off E. E. "Doc" Smith, Hal Clement, Theodore Sturgeon, Jerry Pournelle, Robert Sawyer, Ken MacLeod, and Alastair Reynolds. 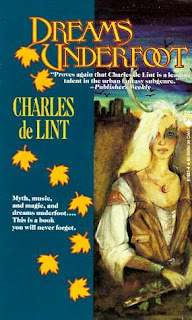 I will send my copy of MoonHeart by de Lint to you post haste. I have read a bunch of his stuff, but of course none of it has ever beat out MoonHeart as my first love among his books. 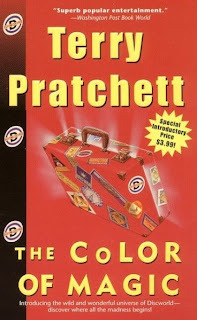 I think you would love Pratchett's Disc World books. Since there are so many of the, I go to the library and get them. I love my library! I have never read a book by Lovecraft and think I probably should. 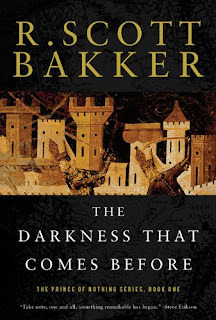 I don't know if you ever got around to reading them, but the R.Scott Baker's series... I could never make it out of the first few chapters of the first book. I've tried to sit and read it three different times over the years and just can't do it.